Hello fellow bloggers! 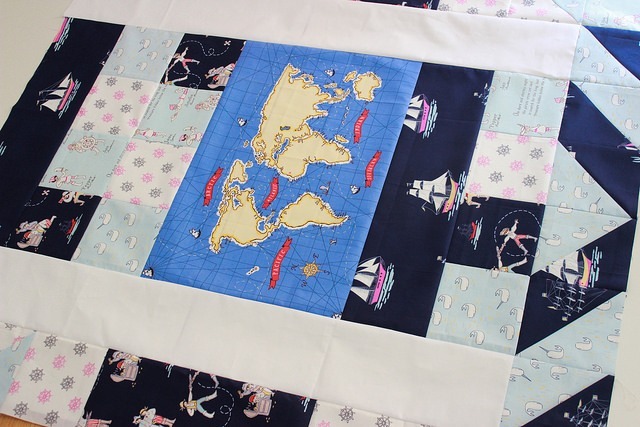 Today I am participating in the Around the World Blog Hop! I get to tell you some things about myself and my creative process. I was invited by Shelley of The Carpenter’s Daughter who quilts who is a really experienced quilter and a new blogger. The main goal of this Blog Hop is to talk about your creative work and process and then invite more bloggers to follow the path. Almost as an endless Blog Hop that goes around the world. I really do not know who started it first, so if someone does please leave it on a comment. I am really curious how far back that blog hop goes.As most of you know I am Greek and I live in Thessaloniki where the last years there’s been an outbreak of quilters coming around from every corner. This sewing hobby has never been popular in Greece but it is gaining ground a lot the past few years. Everything you do in my country regarding quilting is new and exciting! There is almost nothing published in the greek language regarding quilting, and everyone who hears what I do, needs an explanation of what is this type of sewing hobby. For the past months I have dedicated myself on making exclusively baby quilts and quilted pillows in order to fill my shop and leave behind pouches and other accessories. In the meantime also working on favor bags and christening/wedding favors and fulfilling orders. But my main love and obsession was growing on my mind for the whole past year and finally it is alive. I have started a new quilting YT Channel called The Quilt Codex. Its sole purpose is to make one quilt block per video, and thus create a large quilt block video database. My plan is to make videos of more than 2000 quilt blocks and run an easy to search web site in order to find instructions on how to make every block you would need really easily! So my time is split between video shooting, image processing, graphics for the videos and quilt making. I really don’t know!!! It just came one day in 2009, while having a lot of free time on my hands! Maybe my grandma had something to do with that, because as a child I always did crafty stuff, but that stopped as soon as I got 13 years old. Now I cannot think myself of not doing something creative even if I am on vacations or out drinking a coffee. And I know this is called an addiction! I guess the whole process makes me still feel like a child, and now that I think about it, everything I enjoy in life is a bit childish or makes me feel younger (type of music, gaming, social media, sci-fi movies, geek & sundry). For heaven’s sake, I am a 36 year-old fan of Lady Gaga! So there’s your answer! I just go as my instinct tells me. My best ideas where while doing completely irrelevant things. Almost everything I do is spontaneous, and simply if I have an idea on the bus, I write it down and try to make it. Mainly, I get inspiration from all of you fellow quilters-bloggers, from Flickr and Pinterest. Firstly I pick a pattern, maybe modify it a bit and choose my fabrics. Almost never the other way round. And most of all I like sharing, in my blog in social media platforms, and away from keyboard. We have to keep this Blog Hop running so I am tagging two fellow quilters: Karyn @ Milly Made it and Laura @Porcupine Stew. Karyn is from New Zealand and Laura from US. Of course I haven’t met them in person (but I would really love to), I only know them through their online activity. Karyn has an amazing taste in combining fabrics and Laurel apart from her quilting, she is also into screenprinting and embroidery which are both my favorites. Keep this Hop hopping! Stop pinning and start quilting! Linking on to Freshly Pieced, for a WIP Wednesday, and Crazy Mom Quilts! So, this is what you’re up to! You have accomplished a lot, I’m very impressed! I will definitely go a see that YouTube channel, I have a lot to learn! Thank you Daniela! I’ve got a long way..to go still…Hope you like my tutorials! Thanks for sharing on the blog hop with us, Zafira. I love your pink Peek quilt.I am not into pink much either. Are you making finished quilt blocks from all your Codex videos for a possible sampler quilt in the future? Thank you Shelley for a chance in this blog hop!! You’ve been great! Well about the blocks, hopefully when I get enough of them in the same size I will make some quilts, that was the plan to start with, but I really haven’t given much thought about it. One quilt per block is extremely too much for my time…but now I am just keeping them in a box for the future!